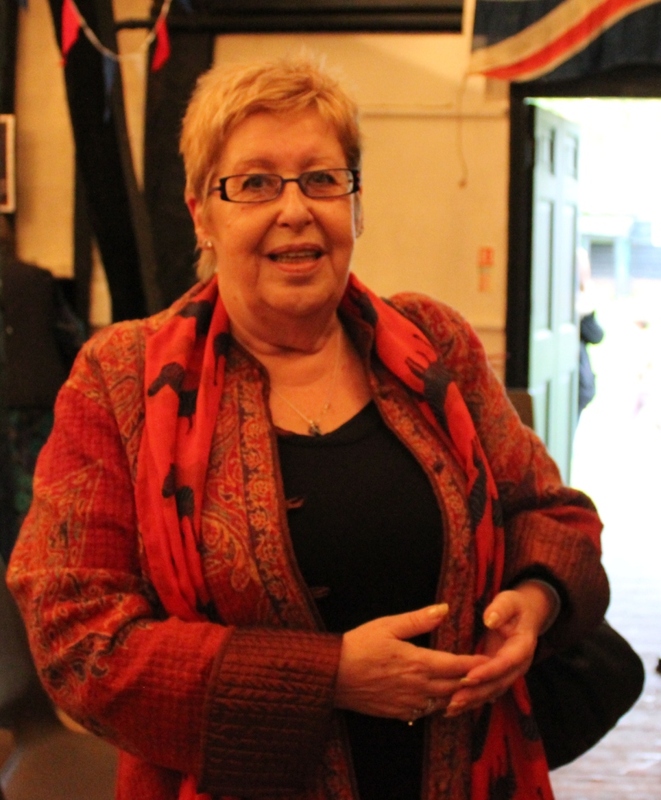 Barbara was born after the war, but writes that the wartime vicar – the Rev. Hugh Cuthbertson – and his wife, Betty, had such a “profound effect” on her parents’ lives that she would like to tell their story. 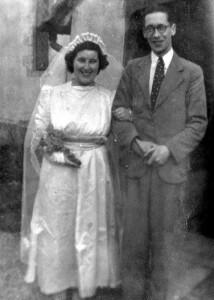 Barbara’s parents were born and brought up in the East End of London; they met at the West Ham Speedway, and got engaged in 1939. Her father, John Mitchell (born 1917), lived in Plaistow; her mother, Edith Harding, lived in Forest Gate. This is Barbara’s story of her family’s wartime experiences, and how they came to live at Tilty. My father, John Mitchell, wasn’t able to serve in the military during WW2 due to him losing a kidney in an accident in 1932. He did however do “war work” and drove a lorry “on the demolition”. In other words he had to pick up the rubble from bombed buildings to clear the streets. During the blitz my father became more and more concerned about the family. Because Plaistow was near to the London docks it was a target for Hitler’s Luftwaffe, so air raids were relentless. Most of the local area had been razed to the ground. He was always a worrier, so after another night of bombing his anxiety had reached a panic stage. He spoke to his boss and asked if he could borrow the open-back lorry. The boss agreed, so he went home to the family and insisted that they gather some bits together and he would take them to a safe place. Such was his state of mind that the only plan was to get them out of London. My father was the eldest, being born in 1917. His brother, Albert, was in the army. Their sister Betsy worked on the land during the war; Stanley worked with my Dad while he was waiting to be called up. 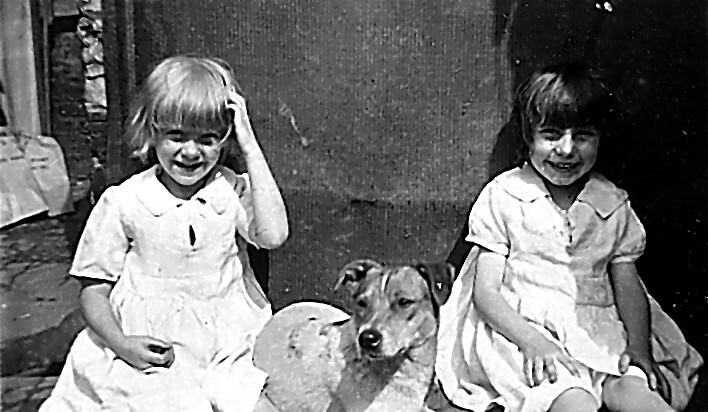 The youngest, the twins ROSE and VIOLET, were about five years old at this time. It was in the afternoon when they were all loaded into the lorry. There was only one problem: Jip the dog was missing. In the East End at that time everyone left the doors open, and as there was very little traffic most dogs came and went as they pleased. And Jip was a bit of a Romeo! My Dad was very concerned about the time now, and insisted that they left right now! So they started their journey, down the road, and onto the main road. When they got about half a mile along the main road, there was a shout – and who should be ambling along the pavement, clearly on his way home, but Jip! It was too late to take him back, so he was bundled into the back of the lorry, and they were on their way at long last. Dad drove for what felt like miles; he was now in an area he wasn’t sure of. In addition it was getting dark, and the little ones were hungry. ‘We will stop in the next town,’ my Dad said. A few miles further down the road was the town of Dunmow. Being at a loss on what to do next, my Dad pulled up and went in to the Police Station, where he explained where they were from and what they wanted – which was somewhere to stay, away from the bombs. The policeman went out of his way to be helpful, and at last he phoned the Rev. Cuthbertson. He was happy to have these people, and Dad was given directions to Tilty Vicarage. On arrival they were given food and drink, and a place to sleep. Once everyone was settled, all the men – together with Jip the dog, who had had the adventure of a lifetime – returned to London. They visited as often as the petrol would allow. 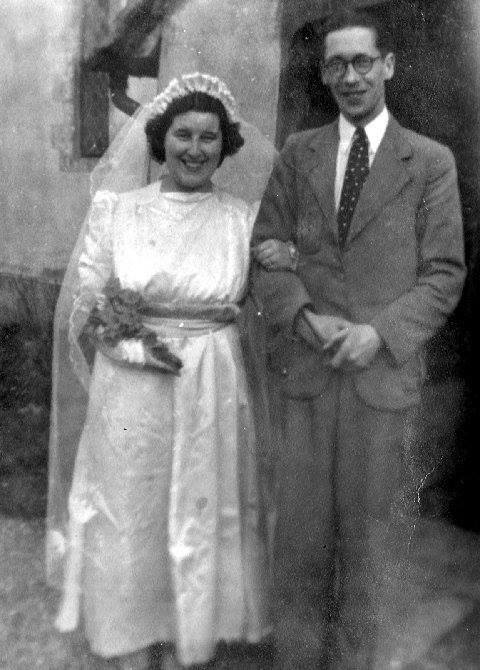 My dad and my mum got married at Tilty (on 22nd February 1941), and they bought her wedding dress in Dunmow with saved coupons. The other fragment I remember being spoken about was that my mother met the Pudney family, and through them she started a career singing on the radio, which sadly ended after the war when I came along in 1948. I don’t think she ever forgave me! My mother also said that lights were seen around the ruined abbey, and the police came to investigate because there was a fear that someone was signalling to the Germans. It was found that there was someone or something walled up in the ruins.